The Domestic Curator: Cioppino, China Town and Dottie's True Blue Cafe! 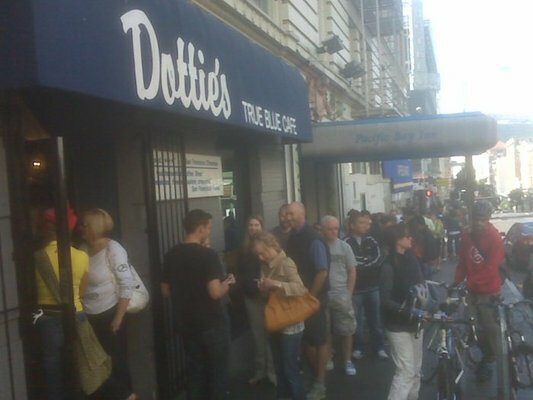 Cioppino, China Town and Dottie's True Blue Cafe! WE LOVE TO TRAVEL. The Porter family. We enjoy seeing new places, meeting new people and experiencing different cultures. 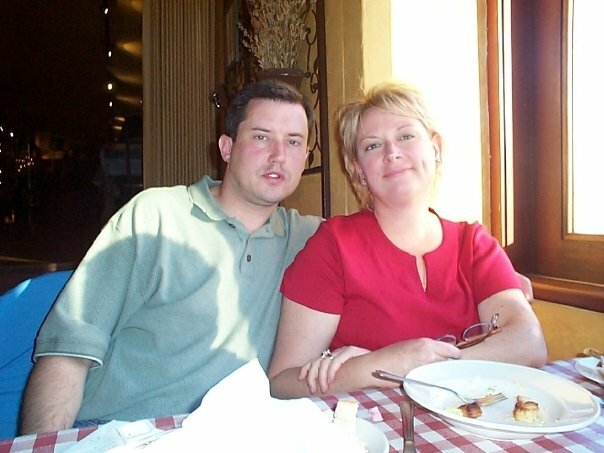 Years ago when the children were young, Greg and I decided to take Jared and Elizabeth with us each and every time we traveled. We felt as parents it was important for them to be exposed to our world on a larger scale. Hopefully we have given them the opportunity and skills to open their eyes and see that there is more to this world than our small little lives here in Dallas. We have drug those poor kids across 3 continents, encouraging them to participate in as many varied activities as possible. Our hope for Jared and Elizabeth is that our travels will help them gain the knowledge and skills that will benefit them through out their lives. So up first I give you Elizabeth's favorite city, SAN FRANCISCO! She would move there tomorrow if we would let her. E deemed San Fran to be very colorful. I must say she is observant, it is colorful....and then some! When we travel, it is my job to learn as much as possible about our destination before we even get on a plane. This allows us to hit the ground running with out standing around looking at a map. I research activities, must-see places, entertainment and most assuredly restaurants. 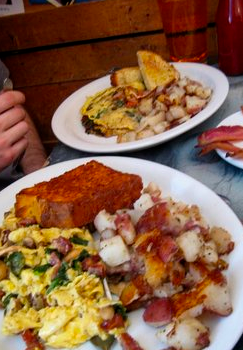 These are my picks for the top 3 restaurants in San Francisco. The three other Porter family members agree with me on this. 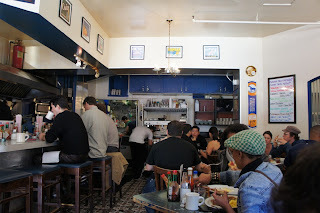 Breakfast: Dottie's True Blue Cafe 28 6th Street,neighborhood: Tenderloin and SOMA. Arrive as early as you can, the line can sometimes wrap around the corner. We have waited as long 45 minutes, but I tell you it is worth every minute you stand in the cold! I know it may not be your cup of tea but WE love Dottie's. The atmosphere is bustling with high energy. 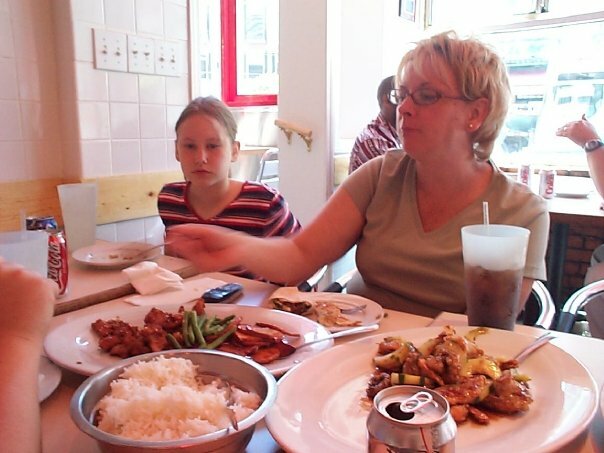 It's extremely small and cramped, but warm and inviting...you get to know the people at the next table for sure. The menu is varied but don't miss the daily specials on the blackboard, they are worth a look. Roasted fennel, goat cheese and spinach scramble, Black Plum Crumble Coffee Cake, Southwestern cornbread...toasted and served with Raspberry-Jalapeno Jam, and the NEVER miss Mango-Blueberry Bread! This truly is a rare and unique find. Dottie's is a Must-See-Eat Sweet Spot!! 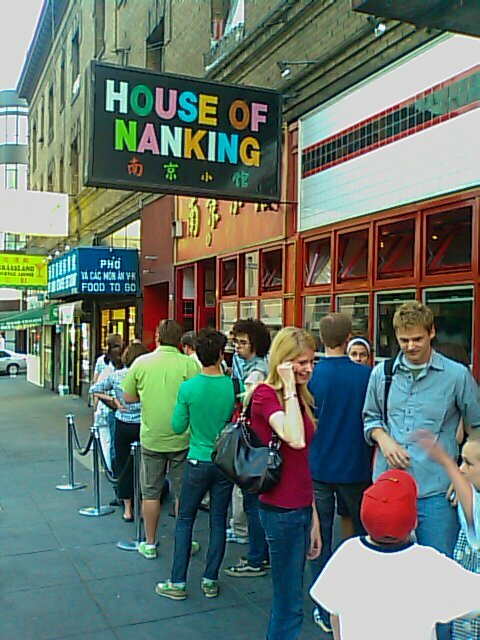 Lunch: House of Nanking 919 Kearny St., neighborhood: Chinatown/Financial District. Again try for an early arrival, maybe skip breakfast and pop in here around 11 am. When the Financial District stops for lunch at noon it can get crazy at Nankings! Fortunately the owner came over to speak with us as we walked in...I'm sure we looked like we had giant V's on our foreheads for vacation. He offered to "fix us up" and asked if we would allow him to order our lunch. He wanted to create a special lunch for us using their house specialties. 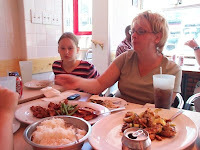 I am NOT an adventurous eater but agreed with the family and the rest is Nanking history. He started off by bringing us pot stickers and pork-veggie dumplings, next came Melt in Your Mouth Fried Calamari with Lemon sauce. It was SO good...I love my lemon! 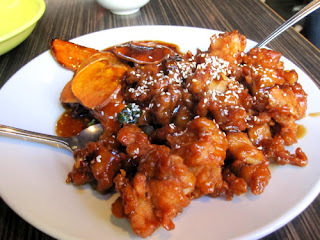 For our main course he brought us Sesame Chicken, Shrimp and Stuffed Mushrooms and Sauteed Fish with Spinach. It was all so wonderful and the owner was such a joy to meet. What an experience! Not to be forgotten! Dinner: Scoma's Restaurant Pier 47, keep walking it's located at the end of the pier. 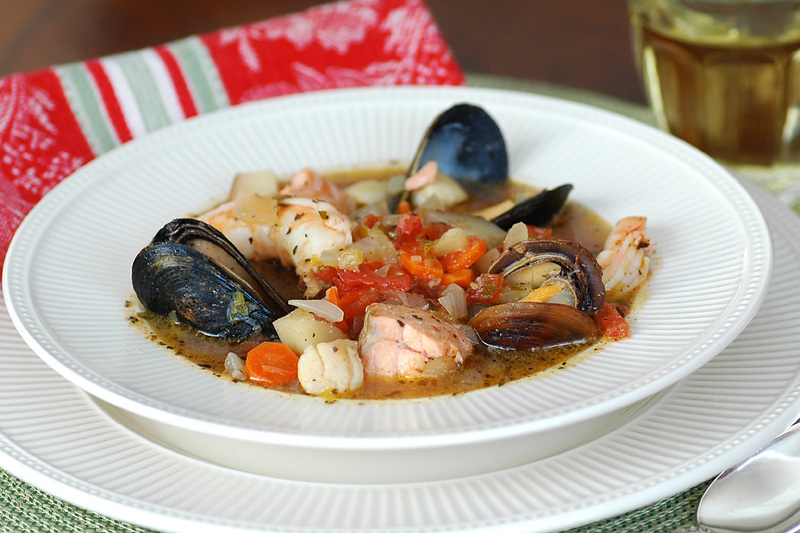 Scoma's has a varied menu but their specialty is Cioppino.This seafood stew is beyond good. Scoma's owns a fleet of fishing boats that head out daily for a fresh catch. This insures the restaurant will have the freshest seafood served out on the piers. It just doesn't get any better than this. Cioppino is a seafood stew originating in San Francisco. It is much like bouillabaisse, but Italian-inspired and locally refined. The seafood used in Cioppino can vary. Back in the 1880's fishermen would throw in the pot what ever was left over from the sale of the day's catch. These men would chop up the various pieces of seafood left on the bottom of the barrels and call out to their fellow fishermen to "chip in, chop and chip in!" Or so the story goes, this is where the name Cioppino originated from. Whether it is true or not it's a great story to accompany a great Seafood stew! Greg, Jared and Elizabeth LOVED this dish so much that I make it as often as I can. It is very brothy with a hint of spice and the taste of the sea. Cioppino is extremely easy to make. Just like the fishermen, throw everything in a large stock pot and cook until the mussels and clams are fully opened. Serve this with a couple of pieces toasted sourdough bread and you have yourself one fantastic Winter meal...it's Hot and Hearty! This recipe is my version of Scoma's Cioppino. 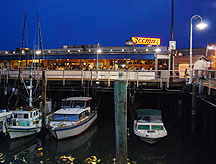 Scoma's on Pier 47, serving up the best Cioppino! Heat the oil in a very large stock pot over medium heat. Add the fennel, onion, shallots, cracked black pepper and salt; saute until the onion is translucent, about 10 minutes. Add the garlic and 1/2 teaspoon of red pepper flakes; saute 2 minutes. Stir in the tomato paste. Add tomatoes with their juices, wine/extra fish or chicken stock, fish stock and bay leaf. Cover and bring to a simmer. Reduce the heat to medium-low. Cover and simmer about 30 minutes. Add the clams and mussels to the cooking liquid. Cover and cook until the clams and mussels begin to open, about 5 minutes. Add the shrimp and fish. Simmer gently until the fish and shrimp are just cooked through, and the clams and mussels are completely open, about 5 minutes longer (discard any clams and mussels that do not open). Season the soup, to taste, with more salt and red pepper flakes. Ladle the soup into bowls and serve with toasted bread. The "Original" Loaded Baked Potato Soup!